Planning a visit to the Walt Disney World Resort? The Wonders of Walt Disney World is the essential read before your visit with Mickey. It’s part guidebook, part secret stories, part informative history, and part of your plan for a magical trip! The Wonders of Walt Disney World will guide you from park to park and attraction to attraction, across all of the Disney property. It will open your eyes to the stories behind the stories of each attraction and bring forth hundreds of secrets that Disney weaves and hides just below the surface. What lasting legacy did Justin Timberlake and *NSYNC leave at Epcot? Which attraction at the Magic Kingdom has been scientifically proven to greatly aid in passing a kidney stone? What does actor Tom Selleck have to do with Epcot’s lovable Figment character? Unbeknownst to Disney at the time, which country announced they were going to be the first to sponsor a pavilion at Epcot, only to have the deal fall apart? 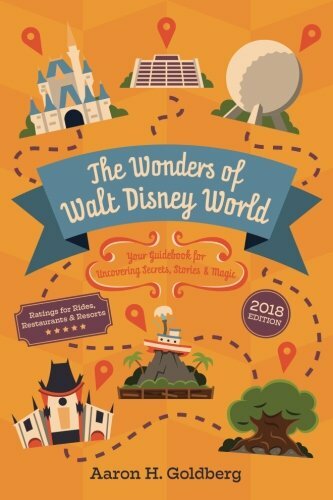 In addition to discovering the secrets, stories, and magic, The Wonders of Walt Disney World elaborates on many subjects a traditional guidebook touches on, as featured throughout are ratings for rides, restaurants, and resorts from the world’s largest travel website. Already have one of those popular yet dense guidebooks? This book is the perfect complement. Updated annually, it’s the perfect companion for your next trip or a nostalgic look back on what you have experienced or may have missed during your last visit. If you’ve never been to Walt Disney World, or even if you visit several times a year, by the time you finish the book, you will have not only a better sense of where things are throughout the parks but a greater appreciation for the attractions themselves. As the un-guidebook, The Wonders of Walt Disney World is a comprehensive and entertaining tour designed for both easy reading and reference. Come discover the wonders that are hiding in plain sight!